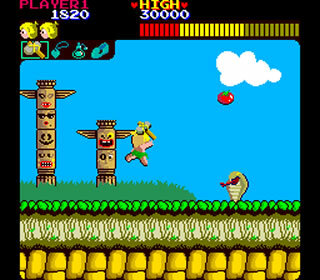 Wonder Boy was seen as Sega’s early attempt at emulating the runaway hit Super Mario Brothers. 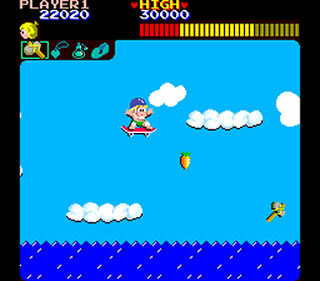 Developed in an odd partnership between Sega and Escape (Escape owned the game but Sega owned the characters, hence why Adventure Island was released on Nintendo consoles) it was originally available in the arcades before being ported to a number of home computers and consoles, including the Sega Master System. The game stars a caveman called “Tom Tom”, who has to rescue his girlfriend from the clutches of an evil wizard. There are 9 worlds each with 4 areas, and secret levels. The game is a standard left to right platfomer, with a few notable powerups. A stone hammer allows you to throw hammers at enemies (and is pretty much essential for getting anywhere in the game), and a skateboard which will give you an extra hit and the ability to go through the level a heck of a lot quicker. There are also negative powerups that prevent you from using your hammer, and knocking off a huge amount of your lifeforce. The lifeforce is your time – if you lose it all you die – however if you collect the large amount of food around the level, it’s not really a problem. After four levels you get to face a boss, which are relatively easy, and then you do it all again. The good things are whilst the enemies aren’t neccessarily too varied, the levels certainly are. Almost each level has a different look to it, even if they aren’t hugely different to a level say as Super Mario Brothers 3. The game is also quite pretty, and the music is annoyingly addictive. The game is also HUGE. There’s over 35 levels in the game, plus secret levels should you collect every single Doll (one of which is included on every level). The levels aren’t tiny either, and get difficult quite quickly. The bad things are the music. It is one of songs that sticks in your head, but after repeating itself for the 5,000th time, you’d want to tear your hair out, it’s just a little to short so it becomes repetitive (unlike – say – Bubble Bobble). It’s also incredibly tricky. The game requires almost pixel perfect jumping and enemies can kill you with one hit (unless if you have the skateboard – which are few and far between). Thankfully this game has unlimited continues, as you will need every last one of them. Nevertheless, this is quite an enjoyable game. It’s never going to change the world, but it’s solid, fun and will keep your interest for an afternoon.